We’ve seen a number of recipes from other bloggers that we can’t wait to try like the grilled peach feta salad with lavender dressing over at Chef in Disguise. 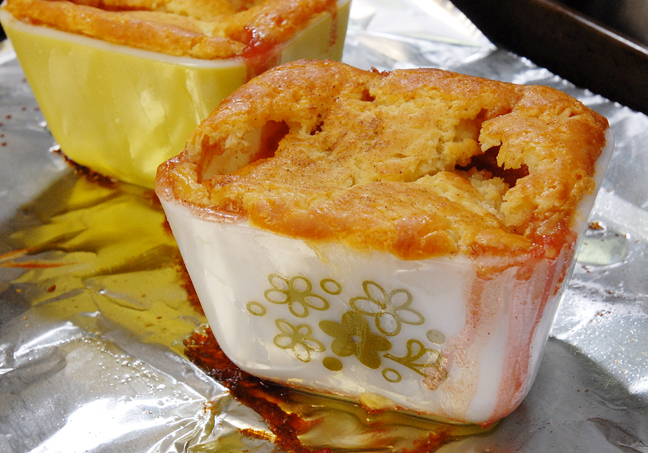 There’s also the fresh peach ice cream over at Sweet Pea’s Kitchen; the just peachy summer muffins over at Sweet & Crumby and the peachy peach pie at The Southern Lady Cooks. This entry was posted in Appetizers, Breakfast, Dessert, Food, Recipes, Spirits and tagged baking, Breakfast, cocktails, desserts, entertaining, mixed drinks, roundups, seasonal. Bookmark the permalink. 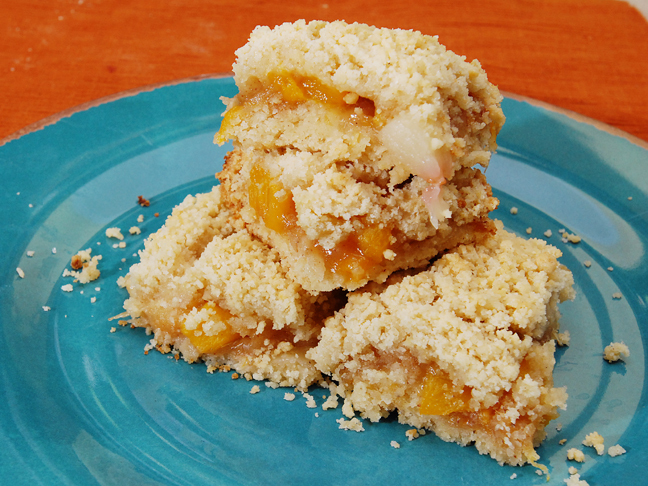 The peach crumble bars were so very very good especially warm and with a scoop of french vanilla ice cream. I can almost taste them from last summer. It is hotter than hell here in the Peach State. Calls for a fuzzy screwdriver for sure. That is a lot of options! And they all look great. 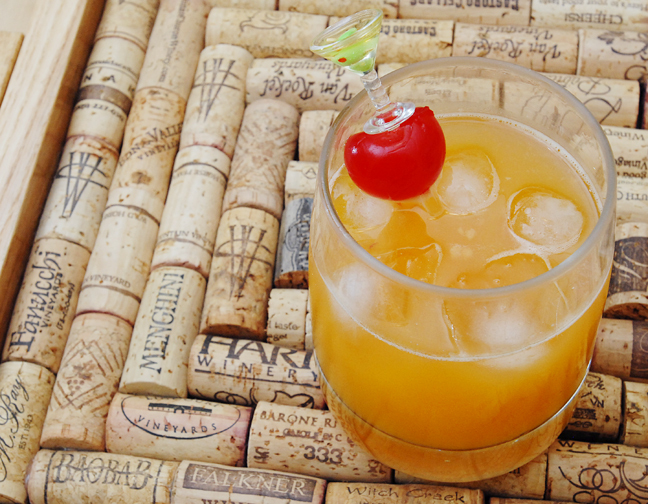 Yum… How about peach infused bourbon? That peach jam with amaretto sounds so good! The peaches and blueberries and the grilled peaches really do it for me. Peachy keen! All of them. What a compendium. Our peaches are not in season yet, but you can bet that I’ll be coming back to this post when they are. Incidentally, I made Sawsan’s peach salad and it was TDF! So good. A great post with a little something for everyone. 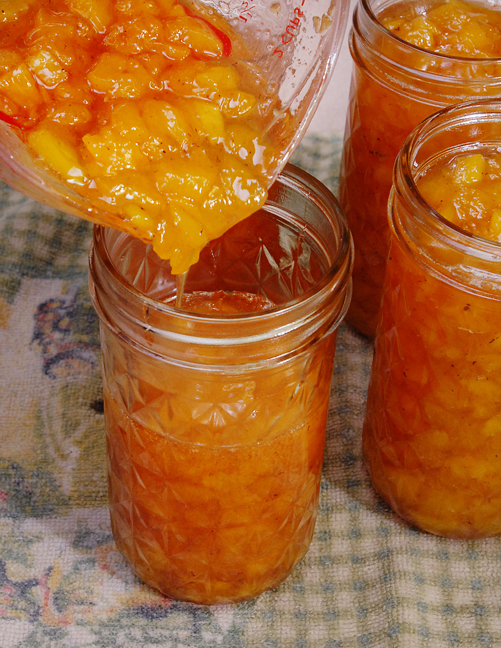 I’ve been thinking of canning peaches this year and your amaretto recipe will definitely come in handy if I do. Thanks! OMG! What a wide range of delicious choices…let’s take it from the top…. Wow. I am so sending this to my parents! They have multiple peach trees, although most are “blackboy” peaches (doesn’t that sound PC!). I don’t know why I had never though of honey, lemon and mint dressing with blueberries…that sounds absolutely heavenly (admittedly I have only recently begun to warm to mint, but still). Thanks for this awesome roundup! Oh my! These recipes all look great. Can’t wait to try them. The heat is terrible here. We are under an advisory today and setting records for this time of the year. Stay cool and eat peaches! Have a great weekend. Same here. It’s been above 100 almost all week, or maybe all week. I’m too heat adled to say. 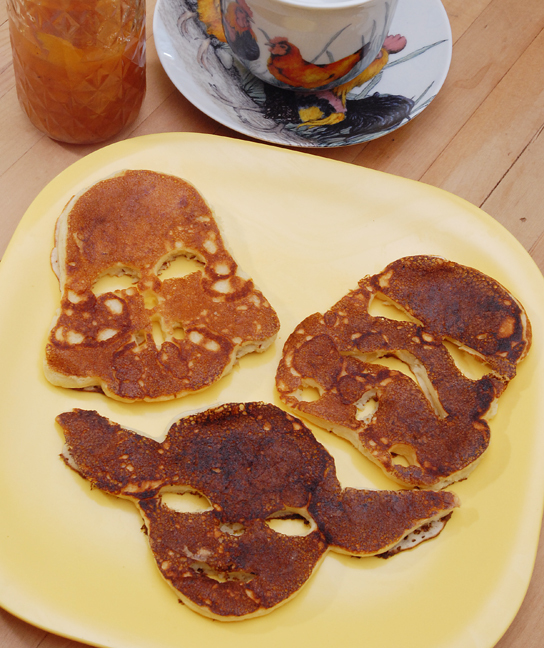 Great Photos – Love, love the pancakes – ha! – thanks for sharing! Happy Saturday! You had me with the first one! These all just look peachy! 😉 Seriously the first one is making my mouth water. I would totally go and get some if I wouldn’t turn into a raisin as soon as I step into the nyc heat. 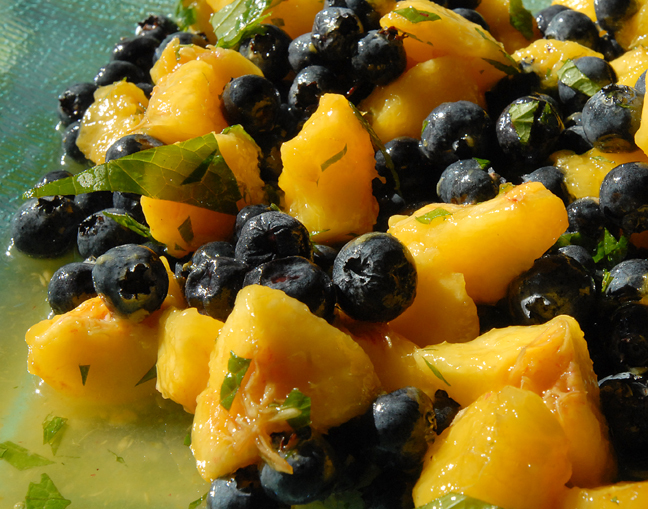 At first glance of the pic I thought that was a mango/blueberry/basil fruit salsa (which I’m so going to make now). Your peach fruit salad is simple and looks/sounds so tasty! Since Hubster and I were married in July, our wedding cake had fresh Georgia peaches layered in the middle, shipped up fresh that morning. Yum! 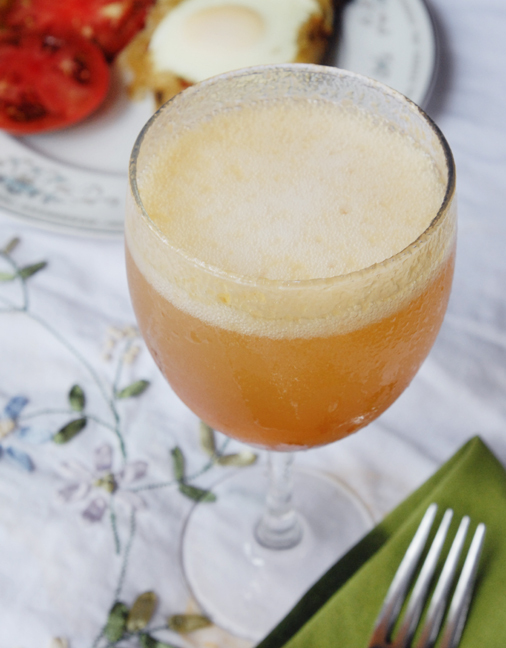 I’m thinking you guys like peaches… good thing I do, too! 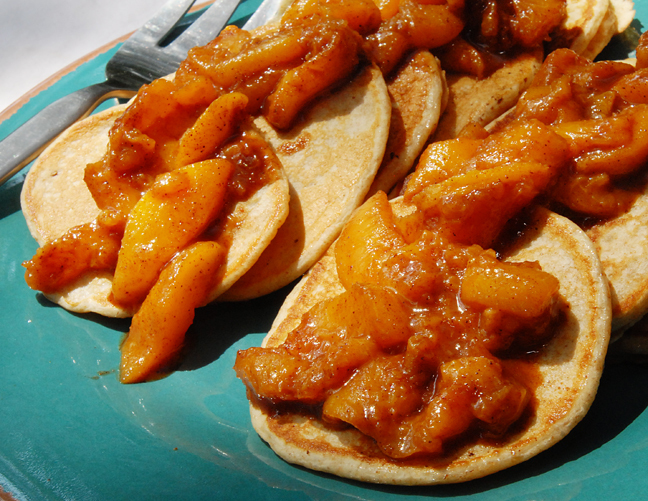 Love peaches from the grill and your jam sounds pretty awesome! 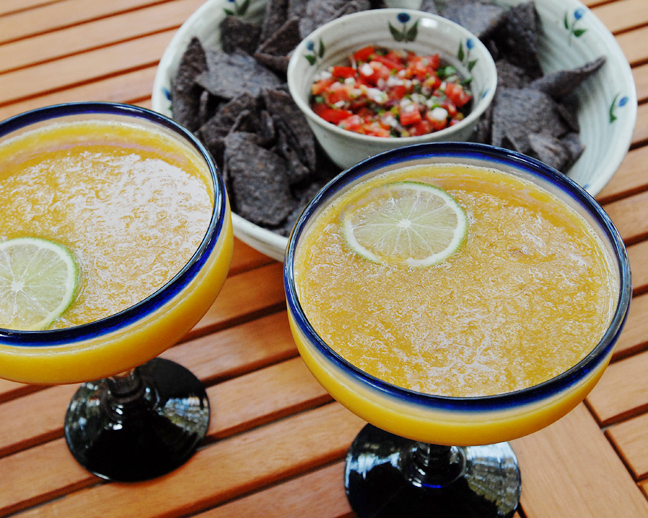 I’ll have a taste of everything with a full glass of the margarita! You’re so lucky to have an abundance of peaches. 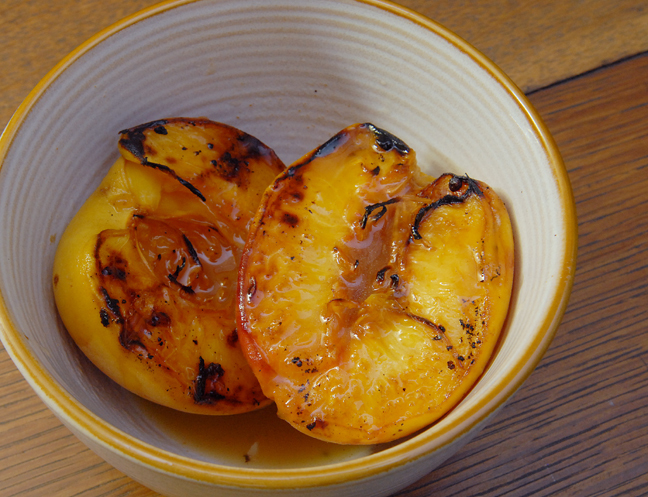 I looooove the grilled peach recipe. I’m back from my long Canada Day weekend camping extravaganza and it was mah-ve-lous, darling! Just as fabulous? As I strolled back into my new week, a welcome, wonderful realization: PEACH SEASON IS HERE! I am a full on Peach Freak. I love those sweet, juicy goodies and have yet to find a peach preparation, recipe, drink, juice or preserve that I didn’t enjoy. Honestly. Not a one. Peaches are my favourite summer fruit and can be enjoyed in such a huge variety of ways, that I wanted to find an article to share with you that was creative, beautiful, tasty and full of delectable peaches as they start to fill your local farmer’s markets and grocery stores. Mission accomplished! Yes, peaches are rich in niacin, thiamine, potassium, calcium and beta carotene. Yes, all of the above spell lots of Vitamin A, antioxidants and cleansing benefits (Eastern brewed teas made of peach pits supposedly work wonders on the digestive system), but my main concern for this celebration-of-peach-post is flavour and pizazz (insert my hearts-in-eyes face checking out those golden grilled peaches with sweet vermouth :). I hope you enjoy all of the unique recipes in this reblog! I would love to hear your favourite ways to eat peaches (feel free to email me your recommended recipes!) Or, let me know which of these ideas tickle your fancy! Hope you are having a peachy week so far! tou make me feel hungry! this food sounds like a good mecinie for the body and the soul thank you! 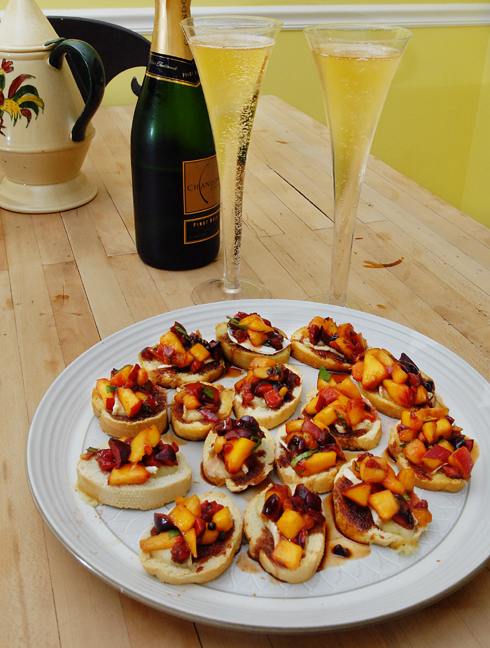 The fresh peaches and blueberries with sprigs of mint and some honey? YES. Perfect way to end a plant based dinner. What a wonderful post to find your blog by! 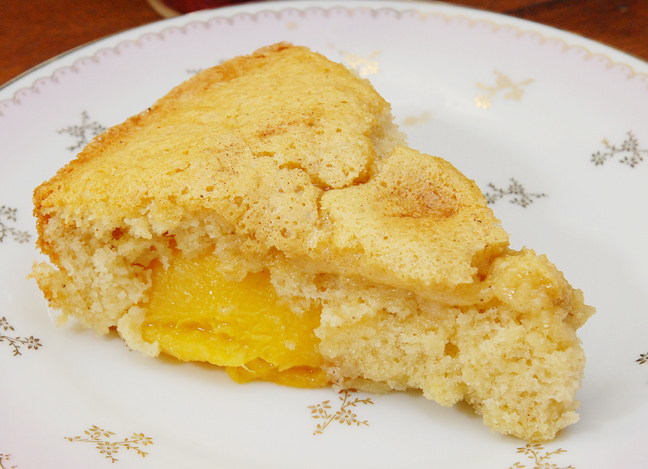 Who’d have thought peaches were so versatile? What a collection!